ISSUE 76 SAILS TOWARD YOU! It’s Summer Time, folks, and we're so glad you have tuned in, as this issue has just gone to press for release on the 25th! Issue 76 marks the Return of the MPC Pirate Ship and all her crew as we delve into the splendid packaging and watery versions of this classic sea faring toy, and discover the hidden, long-held secrets of her character figures! What, you say; there are MPC pirate character figures? Har har, indeed we say. Hidden character figures, they were, till now. We also explore that moment when the packaging changed and the hard plastic versions turned soft, but don’t tell these scallywags they turned soft, they’ll raise a blade to you! 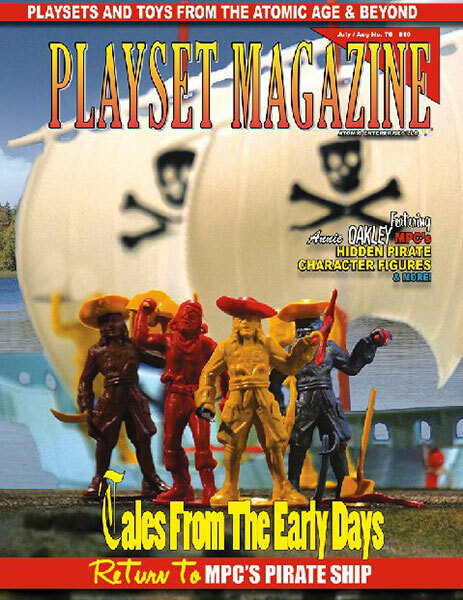 This is a great and detailed companion piece to our earlier Pirates feature (PM10) that covered a much broader range of these great figures and the wider spectrum of the open oceans of pirate toys. Our “Out There” section gets a good look at Revolutionary War displays featuring the great Ron Barzso’s Battle of Lexington Green (done up as an entirely new historical entity) by Craig Remington, and when you turn the pages you’ll find the big Story of Marx’ little darling of the West, the mysterious and rare Annie Oakley figure: where did she come from, was she an imposter or the Queen of the West? Find out right here. There are several more stories to keep you entertained, too. Issue 76 also marks a big moment for us, as this was the number of the last issue our predecessor, Plastic Figure and Playset Magazine published. As such, we dedicate the issue to the late Tom Terry, remember some of the stories, and turn back the pages of time to reflect a bit on where we came from. Where did the hobby start? When did it start? Who started it? This issue we name their names and honor the legends. There are many more stories which we hope readers will fill us in on, as by no means does this issue intend to be the be all and end all of the history of the hobby. Send in the names and the tall tales, they’ll find a place right here with us. And you know we keep you informed with stories and photos of the latest toy shows – how are they doing? Who came to sell? We deal in photos friend, and you’ll have the full lowdown after reading our reports and hearing what our foot soldiers on the scene, “Wildman” Randy Sabousky and Mike Kutnick saw and pictured. Plus get a load of Auctions and news and all the goings-on in the hobby as it lives and breathes today. It’s a splendid summer right here, troop. And be sure to get out there, dig for the stuff, it’s not going to just come sit on your doorstep waggin’ its little tail for you. Seek and you shall find. We hope you enjoy this warm weather issue, as PM hits the top o’ th’ heap with Issue 76.